Previously on Sweating with Strangers: Bryan Adams is almost upstaged by Mr Courtney Cox climbing some rigging. Sorry, it’s been quite a while since my last post. I got disheartened with this whole blogging lifestyle when Bryan Adams bizarrely failed to retweet my post in which I called one of his songs “utter pap“. But I’m back now, and moving on from the disappointment. Let’s return to the joyous summer of 2002. The world was a scary place on the brink of insanity, there was a simpleton in charge of America, and England were really good at a World Cup right up until the point that they really needed to be good, and then they were rubbish. Wait… which gig is this? Insanity, as they say, is repeating the same actions and expecting different results. That’s pretty logical, really, and difficult to argue with, and yet, this is the story of me ignoring that most sound of advice, not once, but twice! Firstly, having spent a fairly miserable year stacking fruit and vegetables between finishing high school and starting university – instead of having life-affirming adventures as so many others did – I was now spending a miserable summer stacking fruit and vegetables six days a week between my first and second years. It was the longest three months of my life, as I yearned to get back to the seaside and – frankly – to my nine hour weeks. Not helping with the boredom was my utter lack of either money or car, which in turn led to only two gigs being booked that summer. With Bryan Adams over at the start, that left only Reel Big Fish in Oxford to look forward to just before heading back to uni. I’d first heard of Reel Big Fish when I randomly caught the film BASEketball on TV late one night in 2001. If you’ve never seen it, I recommend you check it out, but only if you like sport movies, spoofs and gross-out humour. It stars Trey Parker and Matt Stone – creators of South Park and Team America – as two average American losers who create a sport and become national heroes. While they are on their way to achieving their dreams, their team’s house band is Reel Big Fish, who appear without comment or explanation, and almost steal the film with their ska-punk cover of A-ha’s classic ‘Take on Me’. Ah, there’s nothing like a good punk cover of a pop song. Incidentally, Weezer have recently released a cover of the same song, and someone more talented than me really needs to mix the two tracks together. The video writes itself: A-Ha are watching television in their small apartment when they hear someone – Weezer – playing their song in the next room. As they listen through the wall, the first chorus finishes and suddenly some trumpets burst in from the apartment on the other side. It’s Reel Big Fish, and they want to jam too! Then the whole thing becomes drawn in pencil and goes viral. You’re welcome, world. But I digress. Although I loved the movie and that awesome cover, I didn’t look into the band any further until a year later at university, when my friend Rob sang ‘Somebody Hates You’ to me over and over again after one of our classmates got into an inexplicable mood with me. As was often the case, I had no idea what he was on about, so he explained it was a Reel Big Fish song and said “I thought you liked them?”, to which I replied “Well, yeah, I liked Take On Me.” Eugh, I was the worst kind of fan! Naturally, I had to investigate further, which was surprisingly difficult with Reel Big Fish, as none of their albums had been officially released in this country. 2002 was a very different time! Luckily in Exmouth there was a pretty cool CD store in the market, which I often frequented to spend money I didn’t have on posters I didn’t need and CDs that I definitely did need! On this occasion, I was able to acquire their 1998 album Why Do They Rock So Hard?, which was then and is now, absolutely brilliant. 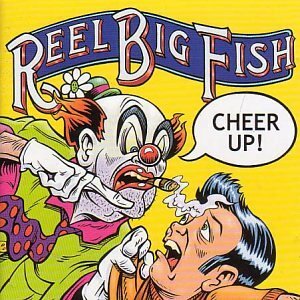 I generally like most ska-punk songs I hear, but in a very ‘I don’t hate it’ kind of way, and that’s true of most other Reel Big Fish albums. But Why Do They Rock…? and 2002’s Cheer Up!, which closely followed my discovery of the band, I absolutely love. They just seem much more focussed than their other records, which is my common complaint with the genre and which stopped me fully enjoying Less than Jake a year earlier. And Cheer Up in particular is probably the best example of the band sticking closest to the ‘punk’ side of ska-punk, with minimal ska involved, so that possible goes a long way to explaining why I adored it so. In any case, I played the two albums endlessly that summer, and snapped up a pair of tickets to see the band in Oxford when they went on sale. I enlisted my ska-punk buddy Ben to accompany me and – as I was in full student pauper mode and had sold my car – somehow decided to believe him when he tried to convince me that he would have no problem passing his driving test three days before the show. Long time readers may suspect how this turns out, but if you’re new, suffice to say that I should have learned from my experience of three summers previously, and not have been surprised when Ben failed his test. Plans out the window, we were saved by the fact it was one of those early gigs that leads into a club night, so we could – in theory – get the last train home. It would require a timely bus or a very quick run into the city after the show to make it, but we were prepared to take the risk, and ploughed onwards fearlessly. We made it to the venue in time, and I was pleased to find it was a really small room that would be nice and full during the show. Of course, these days the Zodiac is an O2 Academy – because isn’t everything? – but then it was its own thing, and this show was in its second room, upstairs, entitled ‘The Club With No Name’. It was essentially small stage, small standing area, bar. And that’s really all you need. The support act for the tour were a band called Wilt, whose latest single ‘Take Me Home’ I had caught on MTV2 that summer and really enjoyed. They were not remotely ska, which didn’t trouble me, but did make them an unusual bedfellow for Reel Big Fish. The two bands had toured together earlier that year as well, with Less than Jake headlining. In fact, when I was looking around for reminders of this show, I found so many more references to that tour, that I started to wonder if perhaps we had been so desperate to get the train that we’d just left at 10 and not noticed the headline act about to start. But no, I’m pretty sure this was a Reel Big Fish tour, they obviously just got on famously and decided to hang out some more. Wilt were Irish, and by that I mean that when they were on MTV2 they were described as being ‘from Dublin’, the singer sang and spoke with a strong Irish accent, and that they were quite blatantly from Ireland. So it was a bit odd when they opened the set by saying “Hi, we’re Wilt from California!” I’m not sure if they had moved to LA to try and make it big and were trying to present themselves as from there, or if this was a joke I didn’t get, but I was very confused and suddenly thought that perhaps this was a different band. Three minutes later, I didn’t give a sh**. They started with ‘All Over Now’, which I was hearing for the first time, and it was one of those incredible ‘what is this, and how can I replace my earwax with it?’ moments that make support bands worth always checking out. It was the high-point of their set for me, and I don’t mean that as an insult to the rest of the show, I just loved it that much. Of course, by the time I returned to university two weeks later, I had both of their albums and that song was a firm favourite. They then split up a year later and vanished without trace. Damn. But not to worry, for it was main event time. Reel Big Fish took the stage and opened with my favourite song of theirs – ‘You Need This’ – which is an apt title for an opening number. Yes, we scream, we need this! Bestow it upon us, oh fish-men! To quote Destiny’s Child, it was 8:30 and the club was jumping! Quite literally, in fact, as I could feel the floor moving up and down as the crowd did. Aware that there was a whole other club below us, I reassured myself that this must happen all the time, and they wouldn’t let it go on if it was unsafe, and bounced away. It was a truly sweaty gig. Reel Big Fish were pretty much exactly how I had imagined they would be from their records: loud, very funny, very energetic, and extremely tight musicians. I think you have to be good when there are guitars and drums all over every track, but it was impressive nonetheless. When it was all done, we grabbed the bus back to the station – I wasn’t the lean, mean Parkrunning machine I am now and Ben, well Ben was fat, so the run was out of the question. Although I can’t find a set-list I’m sure they played ‘Take On Me’, and ended with ‘Beer’, which was also in BASEketball. But the standout moment was when a crowd member shouted ‘Scott’s a Dork!’, presumably as a request for the track of that name, but potentially just as an insult to trumpet player Scott Klopfenstein. Bass player Matt Wong strode forward angrily to berate him with “Hey! He doesn’t come to your place of business and shout insults at you!”. They then played the song. That’s it for this time. Thanks for stopping by and please like, share, subscribe, retweet, print-off-and-pin-to-supermarket-post-it-boards this post. And stop by next time, for THE RETURN OF STATUS QUO!!!! You know you’ve missed them.